The 1959 Hitchcock movie “North by Northwest” includes a famous scene involving a cropduster flying over open fields. Back then, the sight of airplanes spraying chemicals over fields as a means of insect and pest control was commonplace. Three years later, Rachel Carson’s Silent Spring would set the stage for a widespread controversy, increasing public awareness about the misuse of pesticides and changing the sight of cropdusters from accepted to alarming. Known as the patron saint of the environmental movement, Rachel was a marine biologist and writer who had written three bestselling novels about the ocean by the time Silent Spring was published in 1962. Her education and experience as a scientist and her skill as a writer enabled her to turn dry scientific facts into accessible, lyrical prose. Rachel did not believe in mastering Nature; rather she believed human beings have a responsibility to protect the environment and the health of all living creatures. Her research led her to believe that the aerial spraying of DDT was harmful to animals and to humans exposed to it. Rachel advocated that people had a right to know what the government was spraying in fields and what exactly was making its way into their backyards. When I was little the East Coast was repeatedly invaded by gypsy moths that ate all the leaves on the trees and lived in giant tent-like things. At the time our neighborhood was full of wildlife — turtles and quail and such. But then the state started spraying with DDT. The trees dripped the stuff all over the ground. There were white globs of dried DDT everywhere. And by the next summer all the turtles and quail were gone. I noticed the difference right away but since nobody was talking about DDT, wasn’t sure what caused it. Then Rachel Carson’s book came out and everybody started talking about it. Scary times. It’s a bit better now, at least, but still not great. Thanks to Rachel Carson. Rachel forced the chemical industry to admit they had not tested the safety of pesticides on humans. They retaliated by vilifiying her and trying to discredit her work, calling her a “bunny lover” and fanatic. Other powerful people understood Rachel’s reasoning and supported her work. After he read Silent Spring, President John F. Kennedy became an advocate and launched an investigation on the use of pesticides. Rachel testified before a Congressional committee, a calm voice of reason who wanted the evidence to speak for itself. While Rachel’s message resonated strongly with the general public, the creation of the Environmental Protection Agency (EPA) did not occur until 1970. When Congress passed the Clean Water Act in 1972 and the Endangered Species Act in 1973, the EPA wrote regulations for the laws and continues to enforce them. 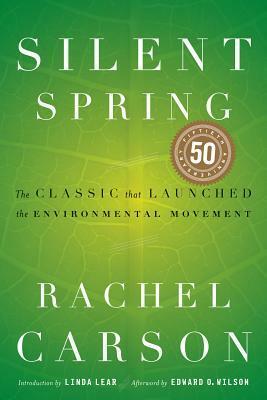 In 1972, ten years after Silent Spring’s publication, the use of DDT was banned in the U.S. Rachel’s opponents blame her for malaria deaths in Africa, but Rachel never called for a ban on all pesticides; she believed in using them judiciously and sparingly. DDT is still used in some parts of the world to control malaria-carrying mosquitoes, but it is now understood that indiscriminate spraying harms the environment, contributes to the decimation of animal species, exacerbates health problems in humans and creates widespread resistance in insects. Rachel’s public persona never gave a hint that she was battling breast cancer in the last few years of her life. Her persistence, courage and determination drove her to continue working. Rachel died in 1964, eighteen months after Silent Spring was published. Like a true Level 5 leader, Rachel was quiet, introverted and more interested in championing the environment and human health than drawing attention to herself. Originally published on the New York Women in Communications blog Aloud.